This vibrant, sporty and fashionable international ski resort is among the biggest and most famous in the world. Les 2 Alpes was built in 1946 on the former high pastures of Venosc and Mont de Lans, two parish villages in the Isère where the northern and southern Alps meet. Les 2 Alpes' ski area is absolute paradise for lovers of snow sliding sports - FREESTYLE LAND snowpark is exceptional, and you're guaranteed real snow throughout the season thanks to the glacier that rises to 3,600 metres' altitude. Families are especially well received at Les 2 Alpes - we have the FAMILLE PLUS label and several other labels (QUALITE, TOURISME) attesting to the excellence of our services and accommodation (2 ALPES QUALITE apartments). As well as snowsports, the international atmosphere makes for a festive mood, with lots of sociable events and activities for families, and opportunities for stylish shopping. 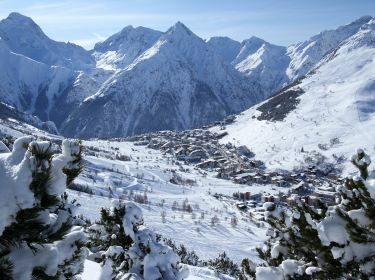 If you're looking to get away from it all and enjoy an unforgettable snowsports holiday, breathing pure air and surrounded by beautiful scenery, then Les 2 Alpes is the place for you! Free ski box if you rent your equipment in our shop ! Let's come and visit us on Facebook, many news on line ! For all informations about sporting and leisure activities, shops, bars & restaurants, services : tourism office of LES 2 ALPES. All the informations about weather and snow conditions at the different altitudes on the ski area. Check out all the different options to find the ski pass that suits you & make the most of les 2 alpes ski area.